I recently welcomed three guests into my nest and like the Magi, the noble pilgrims that came “from the East,” they each presented us with gifts. The pint-sized, dimpled one offered hot chocolate and while all the boys darted for a busy morning of intense play without a break for even a sip, we still are delighting with the thoughtful offerings from our dear friends. 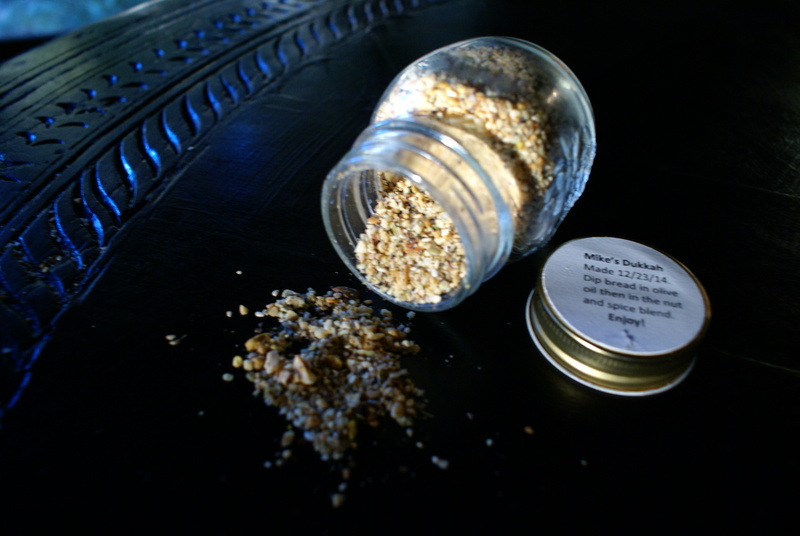 The second gift of Dukkah was home-made and became an instant hit in our nest. 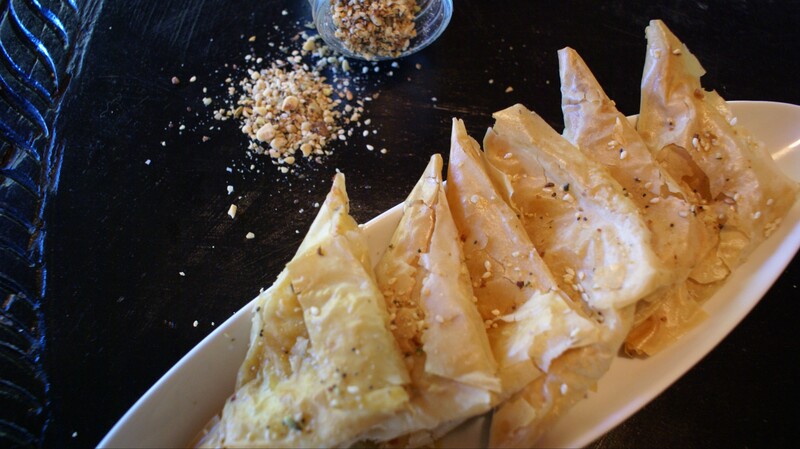 While it can be enjoyed as a sprinkle to some olive oil followed by some mopping from your favorite bread, I wanted to give my tiropitakia a little pop this New Year and so instead of only sesame, I generously dusted my little cheese pies with this mysterious blend of finely crushed nuts and spices. Finally the third pair of hands extended out a bag of Clipas for us. We have been discussing a giveaway for my little ‘ole blog and I came up with my closet idea—why not use this clever device inside your nest as well? I have known and used Clipa for a couple of years now, in fact a few of my rings have been so well loved that they found their way into friends’ lives and now they are hooked on Clipa as well. My introduction to these simple yet inventive rings was through the social circles of my son. The fab mom, of my son’s friend is passionate about her company, topcor, and the products prove themselves meal after meal no matter where your dining preferences may be. Women tend to never leave their nest without a purse or pocketbook and many times we find ourselves at a loss of where to place them while at dinner. When dinning out I fancy a carefree experience, not one where I fret about my belongings on the floor as dirt is shuffled about, or uncomfortably pressed between myself and the banquette. I have envisioned Clipas in our new nest dutifully hanging items and simplifying my mornings-on-the-go with a categorized closet. You can be sure these sturdy and sleek apparatuses will not disappoint. 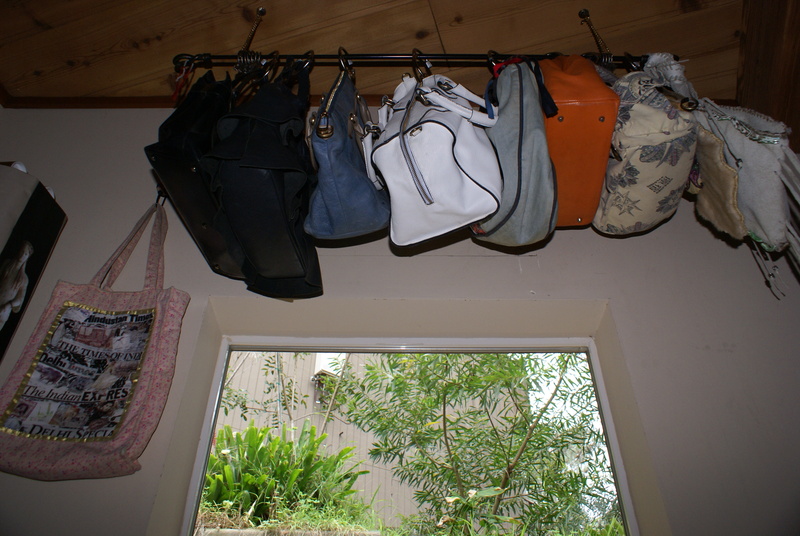 With limited storage, I created a niche for all my purses and I couldn’t think of any other design than these witty gadgets to hang them. Why should you limit yourself to places outside your nest, when they are just as dexterous for organizational projects within your nest? I am thrilled to share this idea with you and hope to inspire some first-of-the-year organizational projects in your nest. This project enlightened me to an even more beneficial idea that I am revealing for the first time with you! Now every time I switch purses, it couldn’t be easier. I simply remove the Clipa with my purse from my hanging rod and leave it clipped onto my strap and voila it’s ready to perform anytime my heart desires. Inspire us and jot a comment about how Clipa will transform your lifestyle. Check out all of the Clipas here—if you choose to like Clipa on Facebook even better. This applies to dudes as well, whether you are brave enough to carry a man satchel (Indiana Jones did it!) or your casual backback, the Clipa can withstand your gear as well. 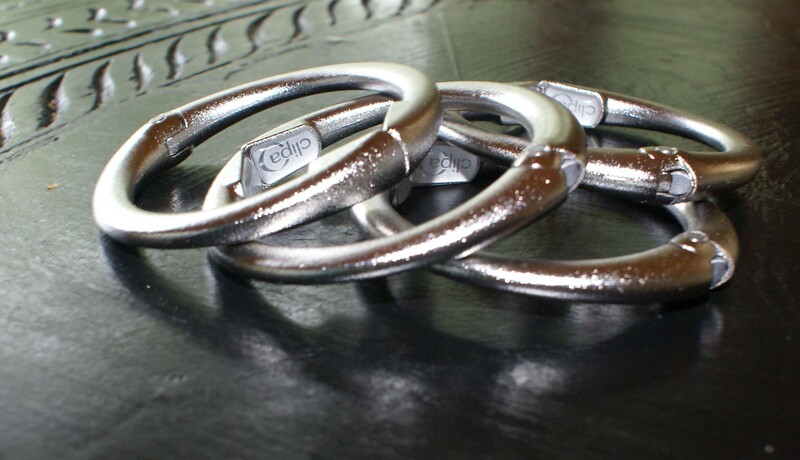 Two random winners (anywhere in the US) who make their wise comments will be eligible to win the Bright Chrome Clipa. Winners will be announced Friday, January 16th…good luck! Well maybe one will head on your way and you can see for yourself! That’s usually the reaction I hear. Thanks for stopping by! i thought they were binder rings! Oh contraire my friend…its no use as a binder ring as it “clips” on and off easily. It’s designed to hold items hanging from just about any ledge. Do give it a try. Yes, of course you could use other hardware rings if your budget doesn’t allow for more than one Clipa in your nest. However, I recommend at least one Clipa that will be useful interchangeably with purses when out dinning or at an event. Congratulations you are the winner of a Clipa, please provide me with your information so that we can ship it out to you. What a simple and ingenious idea! I need to get my wife one of these. How thoughtful of you…she would appreciate it especially if you are often dinning out. Congratulations you are the winner of a Clipa! You are most welcome…enjoy hanging your man satchel. Yes, I recently discovered it for organizing, however, it’s wonderful for holding up your gear!